Samba Mundial, Silicon Valley's samba school, is a non-profit organization dedicated to community participation. Samba Mundial's dancers and musicians perform traditional Brazilian-inspired movements and percussive sounds. The group welcomes new dancers and musicians of all ages, beginning or advanced. 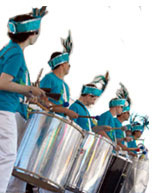 Samba Mundial offers an enjoyable and encouraging experience for all. So come join in the fun and excitement! Shake those hips! Play that conga! Move those feet! And don't forget to join us in the annual San Francisco Carnaval Parade as well as other gala events and performances! Copyright ©2001 - 2008 Samba Mundial. All rights reserved.